“They called her ‘stupid cow’, though she was smart enough to capture the man she loved when everyone—he, most of all—said he’d never marry. Considered insignificant by those around Hitler, she was one of the Third Reich’s best-kept secrets and filmed the private lives of many notorious Nazis. Eva Braun paid a big price for the name ‘Hitler’. And in the end, it was hers only for a day, and now, no one ever calls her ‘Eva Hitler’. With these words, Anna Dahlberg begins an exploration of Hitler’s infamous mistress and her friendship with Anna’s mother in my novel, The Munich Girl. Seventy-three years ago this month, Eva Braun’s world, and life, were coming to their end as Germany succumbed to defeat and ruin. From a bunker under Berlin, she wrote her final letters, to her younger sister, Gretl, and longtime friend Herta Ostermayr Schneider. On this same day, she chose an action whose significance would only be revealed later, during the war crimes trials in Nuremberg. In testimony there, a high-ranking German officer credited her with ensuring that one of Hitler’s last desperate orders had come to him, on April 22, rather than to someone who would actually carry them out. As a result, the lives of about 35,000 Allied prisoners of war were saved. Among them were likely two relatives of mine, and a whole lot of those who were the loved ones of tens of thousands of people. When writing fiction that includes elements of history, accuracy must always trump creative possibilities. It’s been suggested to me several times that Eva Braun’s “character” in the story might be conveyed through letters. However, her very last letter, to her younger sister, Gretl, asked that most of her correspondence be destroyed, and the remaining small amount hidden. It has yet to surface, and those who’ve tried to track it down doubt it ever will. Book clubs and groups who are interested in adding The Munich Girl to their schedule are welcome to inquire about discounts on book pricing. I also love visiting with book groups via skype or, where possible, in person. Learn more by emailing info@phyllisring.com. Categories: Creativity and spirit, The Munich girl - A novel, This writer's path | Tags: author visit, Berlin, book clubs, book groups, Eva Braun, Fiction, Germany, Gretl Braun, Herta Schneider, historical fiction, Phyllis Edgerly Ring, The Munich girl, The Munich Girl: A Novel of the Legacies That Outlast War, Third Reich history, WWII | Permalink. What led me to write a book about Hitler’s mistress (and eventual wife), Eva Braun? I had a chance to ponder these questions again during this summer’s conference of the International Women’s Writing Guild at Muhlenberg College in Pennsylvania. The IWWG is a wonderful network that fosters the personal and professional empowerment of women through writing. An extra treat there this year (and there were many) was hearing CBS Sunday Morning contributor Nancy Giles as keynote speaker. Her blend of insight and humor lingers and encourages me, still. It was right in line with IWWG’s focus on the development of our “inner ability to perceive the subtle interconnections between people, events, and emotions”. If you’re a woman and a writer, check out: http://www.iwwg.org. In a wonderful memoir workshop led by author Maureen Murdock, I had a chance to ponder some of those “subtle interconnections” as I reflected again on that Eva Braun question. In one workshop activity, I wrote: “What a paradox that she often spoke very directly to — even scolded — her tyrant of a lover, yet also ceded her entire life to him. “Who knows which of her unnamed roles was really the more significant, in her time? The buffer she sometimes provided for others around him? The diffuser of tension she so often was, or the soother of circumstances that others undoubtedly came to rely on during the self-will-run-riot mania of a self-appointed despot? 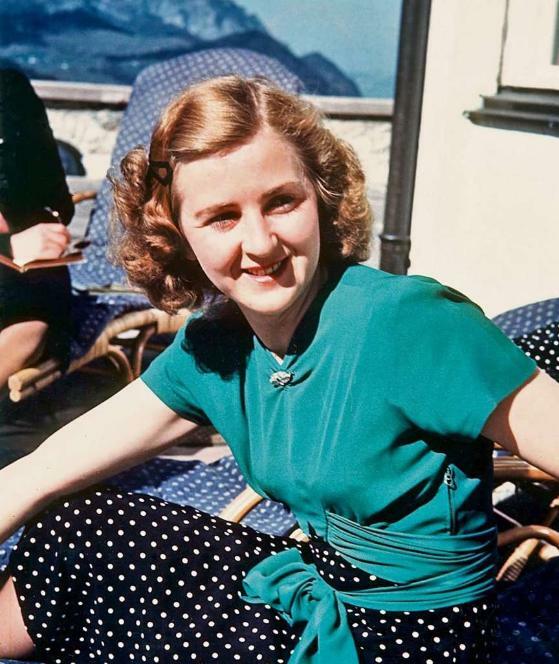 In Eva Braun’s case, that invisibility lasted the entire 16 years she spent with Hitler. Ironically, because she was considered so insignificant, she was allowed to film the visual evidence that proved — though he publicly protested to the contrary — that the Führer did, indeed, have a private life. One he never would have had without her. A question that still lingers for me is, did she? Categories: Creativity and spirit, The Munich girl - A novel, This writer's path | Tags: Eva Braun, Germany, historical fiction, Hitler, International Women's Writing Guild, IWWG, research, The Munich Girl: A Novel of the Legacies That Outlast War, Third Reich history, women's lives and friendships, Writing process, WWII | Permalink.